PJ35. Matryoshkina Vodka Bottle 10"
An empty bottle of Matryoshkina Medovya vodka. This is an unusual bottle, and is a special rare, very limited edition. The bottle stands at 10" Tall. Made in Moscow Russia. 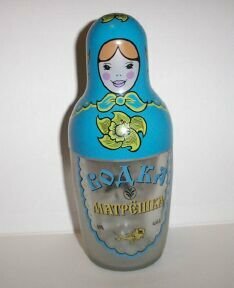 Matryoshkina Medovya vodka in Russian translation means Matryoshka's Honey‘s vodka.